It is roughly estimated that at least 70 large warehouses where armaments were kept, have been completely looted. In order to illustrate the magnitude of the issue, the amounts of weapons missing could arm a medium size conventional army. From one storage facility alone, 482 SA-24 anti-aircraft missiles went missing. Moreover, in tens of thousands are estimated the 122mm Grad type rockets gone, as well as 125mm and 130mm and anti-aircraft projectiles of 14.5mm and 23mm. Also 12,000 anti-personnel mines are stolen. Further, Western-type material was also looted, including US shells of 81mm, Italian anti-aircraft rockets, Belgian-made FN combat rifles and 106 mm shells (at least 30,000 pieces), German explosives, and other. In July 2011 the Italian government had unofficially provided the Libyan rebels after consulting with NATO, with around 30,000 AK-47 rifles, a few thousand rounds of 32mm shells, 5,000 Katyousha type rockets, 400 Fagot type rockets and 11,000 anti-tank rockets. This equipment was from a 1994 confiscation of a vessel coming from Ukraine trying at that period to illegally arm various fractions during the Bosnian war. The Italian authorities acting on a tip from the British intelligence intercepted this vast cargo. The main issue is that since 2011 there has been no confirmation on the whereabouts of the arms provided to the rebels with no guarantee that they have not ended up to international terrorist or criminal groups. The American authorities are estimating that around 1 million Kalashnikov rifles are circulating in Libya and that 5,000 anti-missile rockets have been sold to various third-parties. It is of interest to note that in Sinai Peninsula, local Islamist groups are said to be supplied with SA-24 missiles with a cost of just 3,000 USD. During summer 2012, as battles were raging in Syria's civil war, a shipment of at least 400 tons of arms made it to Syria from Libya, after they illegally reached Turkey in order to eventually supply the Syrian rebels. There is no account where the weapons are nowadays. All the above, in conjunction with the lootings of many arms sites in Syria have literally flooded North Africa and the Middle East with arms. If one adds that there is still a significant trafficking of weapons that were looted since 2003 in Iraq, then it is more than likely that street prices will drop, thus providing an incentive for large shipments to be exported to Europe in order to supply various criminal, nationalistic, and terrorist networks, as well as, in Caucasus in order to be used by Islamist rebels there. 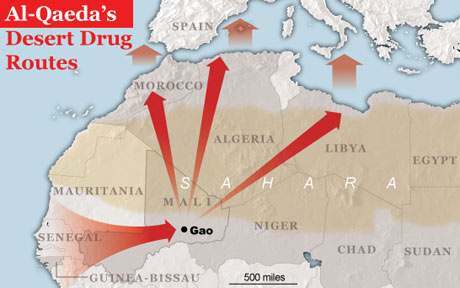 The transfer of these shipments will naturally follow the well-established routes of contraband trade of hashish (From Morocco to Spain), the illegal immigration route (From Tunis & Libya to Italy) and the Balkan narcotics route (From Turkey-to the Balkans upwards to central Europe). It has to be noted that other routes may apply, if one takes into account that a speed boat that can carry half a ton of cargo can reach the Southern Shores of Greece from Libya in less than one night travel, with good chances of being undetected by Naval radars, depending on weather conditions. Other routes that can apply are the Black Sea ones (Turkey to Ukraine or Romania-Bulgaria), or through bogus shipping companies, sailing from major contraband hubs like Beirut towards Montenegro, Albania or Croatia.